On Monday May 23rd the Centre for Economic History, in collaboration with Reading Classics, ran a successful workshop entitled ‘The economic importance of coastal lagoons in antiquity and the Middle Ages’. This workshop idea has developed from Professor Annalisa Marzano’s recent research, which has highlighted how coastal lagoonal environments and the natural resources they offered (eg, fisheries), have been neglected in research work on the ancient economy. This event brought together ancient and medieval historians and archaeologists not only to learn about recent research in these different disciplines and current approaches being used, but also to use information from the medieval period, when documentary data is more abundant and complete than for classical antiquity, as a proxy in studying the exploitation of lagoons in antiquity. Two guest speakers came to Reading from Ca’ Foscari University in Venice, an institution with which the Classics Department has good research and teaching links, most notably with the collaborative masters’ course in ‘Ancient Maritime Trade and Navigation’. Professor Marzano opened the workshop with a paper on ‘Costal lagoons and large-scale fishing in the Roman Mediterranean: an underestimated resource’, arguing for the integration in the same fish-salting cycle of marine and lagoonal fisheries. 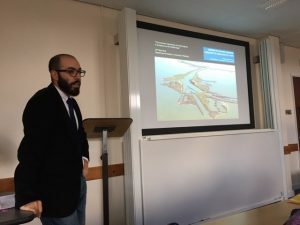 Dr Alessandro Rucco spoke on ‘Fisheries in the early medieval landscape of Comacchio (Ferrara, Italy)’, presenting some interesting data on the scale of human interaction in this very unique natural environment. 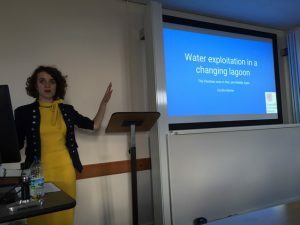 Dr Cecilia Moine concluded the afternoon with a presentation on ‘Water exploitation in a changing lagoon: The Venetian area in the late Middle Ages’, which focused on fascinating archival material from various nunneries and monasteries. Among other things, we learnt that in the case of rent paid in kind to these religious institutions, the two most common items listed in the documents were wine and fish; this surely reveals something about life and diet in these religious houses!